Congratulations to Joyce Tseng ' 16 for winning the bronze medal for Thailand for synchronized diving at the 8th Asian Age Group championship! In our recent ranking of the Most Elite Boarding Schools in America, we considered the school's endowment, acceptance rate, and average standardized testing scores. Phillips Exeter Academy, a 1,200-student-strong high school located in the sleepy town of Exeter, New Hampshire, rocketed to the top of the list. When Dr. John Phillips, a graduate of Harvard and resident of Exeter, opened the Academy in 1781, he set out to teach young men "the great and real business of living." More than two centuries later, the now co-ed school prides itself on the strength of its network, its commitment to spreading kindness, and on its use of the Harkness Method, a unique teaching model that schools around the world strive to imitate. 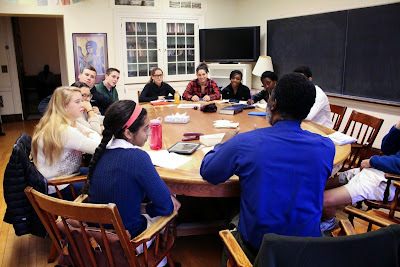 Last fall, I spent the day as a student at Phillips Exeter Academy to see why it's the best.